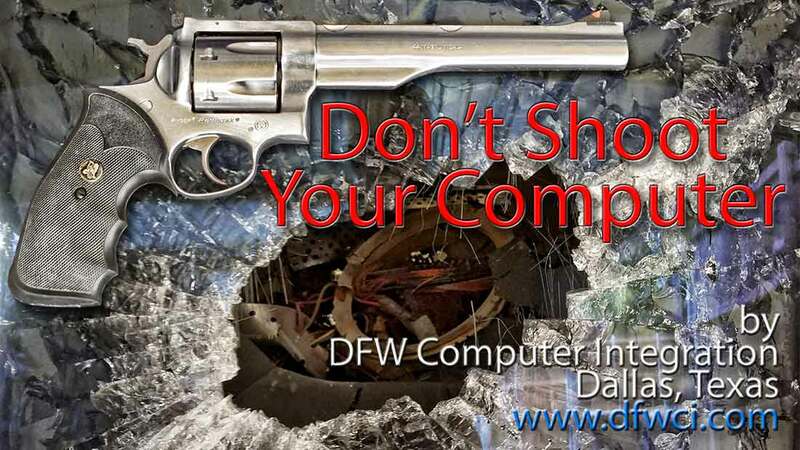 It’s certainly been a long time that I’ve yearned to produce a promotional video featuring the wanton destruction of recalcitrant computers via large-bore firearms (stringing together some of my favorite terms into a single sentence here…) and a couple of weeks ago we finally did it. Prompted by my bride, I enlisted the aid of some business associates (HKLiquidations and REcover) in procuring the needed “victims” and conscripted my cousin and his family property in the hinterlands of rural Texas in which to undertake this project. Recording the action from 3 different vantage points and then assembling it all – and adding some voice-over was a decent sized project and a fair amount of fun. A nod to Clint Eastwood and Dirty Harry for inspiration. You’ll see what I mean in the video. The full-length video is now complete on our YouTube Channel. There will eventually be an outtakes / blooper reel. Currently there are also 3 shorts to isolate each individual event in 60 seconds or less. This video runs just over 2 minutes and 30 seconds. Please rate, comment and share our newest project. Again: Please rate, comment and share our newest version. And tell us which version you prefer. And before you shoot your computer – Call Me, OK? It’s pretty difficult (impossible) to recover data from a pile of debris.